Manufacturers of off-highway vehicles — operated with highly complex numerous switches and knobs — can use EB GUIDE to build UIs that simplify interactions with connected sensors and systems through high-quality graphical displays with functional and intuitive UIs that meet power and heat efficiency requirements of the industry. Kässbohrer Geländefahrzeug AG produces and sells snow grooming vehicles and beach cleaning equipment under the brand names PistenBully or BeachTech. She is the world leader in both product segments. RAFI develops and produces systems and components for human-machine communication. For example electromechanical components, operating panels, touch screens, keyboards, and ECUs . The growing number of complex features of the snow groomer lead to an enormous number of switches and knobs to operate the device. 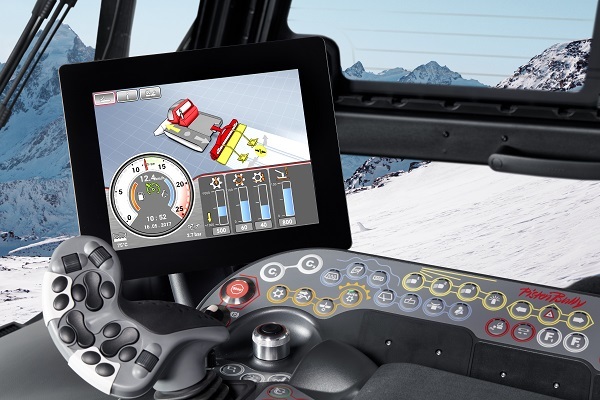 PistenBully therefor decided to switch to a touchscreen solution as HMI (human machine interface). The new user interface concept should improve usability, increase flexibility, and reduce production costs. With RAFI as hardware manufacturer and Elektrobit (EB) as software supplier, PistenBully found the perfect development team to set up the new HMI solution. Whereas RAFI prepared the touchscreen hardware, EB provided the development environment and HMI architecture. PistenBully could then smoothly take over the HMI development, finalize it in short time with EB GUIDE as HMI tool and tailor it to their customers’ needs. The ready solution can be first found in the PistenBully 600 F, other vehicles will follow soon. PistenBully now offers a state-of-the art HMI (human machine interface) with great usability and high flexibility to its strong and loyal customer base. By using EB GUIDE and taking over development work by themselves, PistenBully found a fast and cost efficient way to achieve this benefit.